Washington Court House Elks Lodge 129 recently donated proceeds from their annual Holiday Breakfast to the Well at Sunnyside, The Warehouse, the Fayette County Food Pantry, Buckeye Bikers’ Association and Life Pregnancy Center. The annual breakfast is in its 38th consecutive year. Money was also donated to the Elks National Foundation and the Elks National Cerebral Palsy Fund. Breakfast chairman and Elks’ trustee Rowland LeMaster, on behalf of the trustees and officers of the Elks, would like to thank the community and the members of the Elks for supporting this event, making it another successful year enabling the Lodge to continue their motto of Elks Care-Elks Share. Front row, representing Life Pregnancy Center, left to right: Nora Debruyn, Shawn Lachat, Patty Cox and Diane Farris Munro. Back row, left to right: Rowland LeMaster (Elk’s 129); Molly Gruber (The Warehouse); Chaquita Nash (The Well); Barry Hidy, Barbara Fox, Larry Shriver (Life Pregnancy Center); Karen Bloedel (Fayette County Food Pantry; Sandy Rodgers (Buckeye Biker’s Association) Scott Mullen (Exalted Ruler Elk’s Lodge 129). 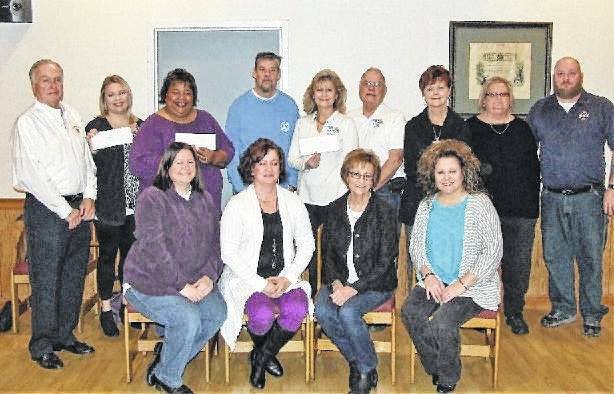 https://www.recordherald.com/wp-content/uploads/sites/27/2017/03/web1_IMG_0061.jpgWashington Court House Elks Lodge 129 recently donated proceeds from their annual Holiday Breakfast to the Well at Sunnyside, The Warehouse, the Fayette County Food Pantry, Buckeye Bikers’ Association and Life Pregnancy Center. The annual breakfast is in its 38th consecutive year. Money was also donated to the Elks National Foundation and the Elks National Cerebral Palsy Fund. Breakfast chairman and Elks’ trustee Rowland LeMaster, on behalf of the trustees and officers of the Elks, would like to thank the community and the members of the Elks for supporting this event, making it another successful year enabling the Lodge to continue their motto of Elks Care-Elks Share. Front row, representing Life Pregnancy Center, left to right: Nora Debruyn, Shawn Lachat, Patty Cox and Diane Farris Munro. Back row, left to right: Rowland LeMaster (Elk’s 129); Molly Gruber (The Warehouse); Chaquita Nash (The Well); Barry Hidy, Barbara Fox, Larry Shriver (Life Pregnancy Center); Karen Bloedel (Fayette County Food Pantry; Sandy Rodgers (Buckeye Biker’s Association) Scott Mullen (Exalted Ruler Elk’s Lodge 129).